CAROLINE KENNEDY, NEW YORK SENATOR, 2018! 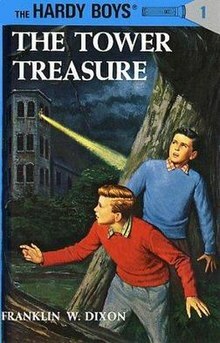 The Hardy Boys, Frank and Joe Hardy, are fictional characters who appear in various mystery series for children and teens. “Mystery of the Urinal Deuce” is the ninth episode in the tenth season of the American animated television series South Park. The 148th episode of the series overall, it first aired on Comedy Central in the United States on October 11, 2006. The episode focuses on the 9/11 conspiracy theories, and was written by series co-creator Trey Parker. Cartman performs an investigation, which he presents to his class in a presentation where he claims the true culprit behind 9/11 was Kyle. Despite the invalidity of Cartman’s claims, he nonetheless convinces everyone that Kyle is guilty. Kyle enlists Stan‘s help, and they leave South Park to find an organization that can prove Kyle’s innocence. The group they find, however, believes that the United States government orchestrated the 9/11 attacks. A SWAT team attacks and takes Kyle, Stan, and the leader of the conspiracy organization to the White House where the presidential officials, along with President George W. Bush, reveal that the government really is behind 9/11. Bush murders the conspiracy leader and decides to kill Stan and Kyle as well, but they flee. Stan and Kyle walk around a street, discussing what has happened, when they spot the conspiracy leader, revealing that he was not actually killed. The boys chase him to a dead end, and out of nowhere a man shoots the leader and tells the boys to follow him to his house, in which he reveals himself as a detective whose sons are the Hardly Boys. His sons got clues from the urinal at South Park which let them determine that the 9/11 conspiracy was a government conspiracy. President Bush and the rest of the politicians suddenly appear. Kyle knows that the government did not plan 9/11 but the Hardly father asks him how he knew their position and Stan points a gun to Kyle. He reveals that he was the one who defecated in the urinal. He decided to blame the government for the urinal deuce, and the government was happy to take the blame as long as it showed that they were the cause of the attacks because it will make people believe that they are all-powerful. Groceries galore delivered to your door! November 19, 2017. About Me, continued. I do not know if Corinne Waters, one of Jehovah’s Witnesses who is now deceased, was the inspiration for Corinne McCormack glasses; I know the Mormon Church of Satan found her fascinating—she was always at the meetings or in field service or visiting Bethel or planning to visit Bethel. I was not able to get a picture of the Mormon CIA agent who took a picture of me pushing my shopping cart walking behind these three women one of whom has a Marshalls (U.S. Marshalls) shopping bag, the other, a Burlington (Covington & Burling) shopping bag. And I cannot remember the name of the resident from Brazil wearing the skin tight red stretch pants who coincidentally rode the elevator with me. She waited, as she had been told to, until I boarded the elevator.